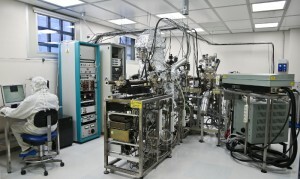 The LASSE (LAyered Structures for Spin Electronics) cluster tool is a multi-chamber system, working in high vacuum conditions (pressure lower than 10-8 mbar), focused on the growth and characterization of films and heterostructures for spin electronics made by oxides (ferro-, ferri- and antiferro-magnetics, ferro-electrics, half metallic), 3d metals and semiconductors. The available in vacuum deposition techniques are pulsed-laser deposition (PLD) and molecular-beam epitaxy (MBE). Surface preparation can be performed in ultra-high vacuum conditions (pressure lower than 10-9 mbar) by thermal annealing and ion sputtering. Analysis and characterization of surfaces and interfaces can be performed in situ by means of electron spectroscopies, also with spin resolution, and diffraction techniques: x-ray and ultraviolet photoemission (XPS, UPS), spin-polarized inverse photoemission (SPIPE), low and high energy electron diffraction (LEED, RHEED), x-ray photoelectron diffraction (XPD). Moreover, magneto-optical Kerr effect (MOKE) allows for measuring in situ the magnetic properties of the sample. The laser employed for Pulsed Laser Deposition (PLD) is a Continuum Powerlite Precision II 8000 quadrupled Q-Switched Nd:YAG laser (266 nm), providing pulses 7 ns long at 2-10 Hz frequency with a fluence of 5.6 J/cm2. The sample holder can be rotated in front of the target and heated up to 920 K in oxygen atmosphere (up to 103 mbar), for pre- or post-annealing and during deposition. Targets are placed on a rotary stage, that can fit up to 4 different materials at the same time (e.g., Al, La0.7Sr0.3MnO3, SrTiO3, BaTiO3). 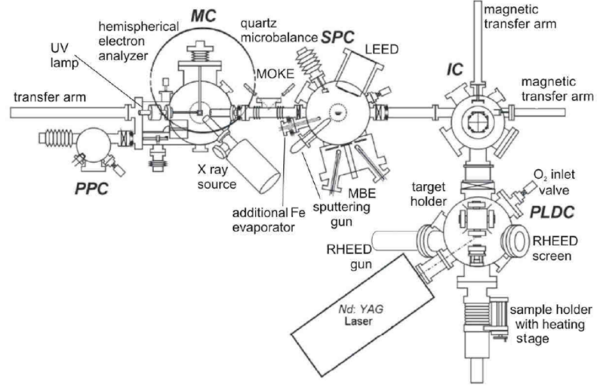 The Reflection High Energy Electron Diffraction (RHEED) apparatus is a TorrRHEED, STAIB Instruments, equipped with a double differential pumping stage for working in oxygen pressure up to 100 mTorr (i.e. during PLD deposition), with electron energies up to 50 keV. The base pressure of the chamber is between 10-10 and 10-9 mbar (ultra-high vacuum, UHV). Molecular Beam Epitaxy (MBE) deposition is performed in UHV conditions employing 7 Knudsen cells, that can be operated separately or in a pair (e.g. for depositing alloys such as FeMn and NiFe). Materials currently deposited are Fe, Co, Ni, Au, Ag, Cr, Pd, Pt, Mn, MgO. Typical deposition rates are on the order of 0.1-1 nanometer per minute. The deposition rate is measured by a quartz microbalance (thickness monitor). The sample is mounted on a holder that can be heated up to 1000 K, for pre- and post-annealing processes or during deposition. A motorized shutter in front of the holder allows for deposition of samples with stepped or wedged structures. Sample cleaning before deposition can be performed by thermal annealing (up to 1000 K) and ion bombardment, employing a beam of Ar-ions accelerated by high voltage (from 500 V to 2 kV) and focused on the sample. A dispenser of molecular oxygen is present in order to perform controlled oxidation processes. The Low Energy Electron Apparatus (LEED) apparatus works in UHV conditions; the energy of the electrons is in the range 0-200 eV. The electron analyzer is an Hemisperical Energy Analyzer (HEA) Phoibos 100/150 from SPECS with 9 channeltrons, with energy resolution down to 0.8 eV and spatial resolution down to 0.1 mm, depending on the operation modes. The Inverse Photoemission Detector employs a GaAs electron source with negative electron affinity (NEA), producing an electron beam with kinetic energy ranging from 0 fo 23 eV and a spin polarization of ±0.5. The energy resolution of the detector is 0.75 eV. The Magneto-Optical Kerr apparatus employs a red laser (635 nm, 5 mW) to illuminate the sample. A couple of coils allows magnetizing the sample in two perpendicular directions, with DC fields up to 10 mT and pulsed fields up to 300mT. The sample is mounted on a holder that can be cooled down to 120 K and heated up to 550 K. A Faraday Cup and a Tantalum reference sample are mounted in proximity of the sample position for calibration of the electron beam position and of the energy references, respectively.